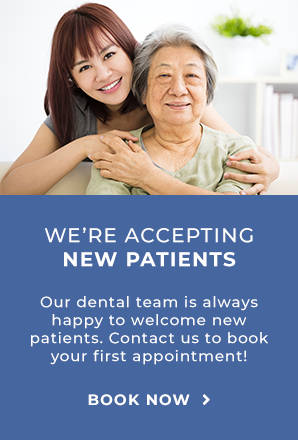 At the Markham Steeles Dental Centre, our dentists love welcoming new patients, both children and adults. Here is some information our new patients may find helpful. We are very excited to meet you! Your first visit will generally take about 60 minutes. Please arrive a few minutes early to give us your Patient Privacy Disclosure form and familiarize yourself with our office. We are located in The Clinic in the Scarborough Walmart – you can find us by going through the Walmart next to the Pharmacy or from the parking lot next to the Garden Centre. During your first visit, we will review your dental care history, as well as any concerns you have about your oral health. Our staff will do a complete oral exam, including X-rays if needed, in order to assess the overall health of your smile. At the end of your first visit we will prepare recommendations, which will include full oral maintenance, and may include further dentistry services that you and your dentist agree upon. We strive to keep our patients up-to-date and educated regarding their care to ensure full understanding of your dental care options. We are here to assist you with calls to your insurance company, in your presence, to determine eligibility and coverage, and to also assist with predeterminations. We believe an informed patient will utilize their dental benefits, which maximizes their overall health. It is the patient's responsibility to pay the fees for their dental procedures. We accept the following methods of payment: Mastercard, Visa, Debit, and Cash. Appointments are scheduled specifically for you. Our team will contact you with a reminder before your appointment. However, it is your responsibility to arrive for the scheduled appointment. We require a minimum of 2 full business days' notice to change and/or cancel appointments.